Specifically, make sure that sanitation shifts have enough staff. This can be difficult when there is an industry-wide shortage of food processing workers and production hiring takes priority. For 2018, plan how many sanitation employees your plant needs, execute a recruitment strategy for filling positions and invest in training and incentives to demonstrate how valuable they are to your business. If hiring and retention are struggles, one way to alleviate these challenges is to look into a contract sanitation company. Companies like PSSI take over sanitation shift management and ease the burden that comes with hiring and retention. Food processing overall, and sanitation in particular, have poor reputations when it comes to team member safety. A safety incident during a sanitation shift is not only costly in terms of medical expenses and lost work time, but it also damages your plant’s reputation and makes hiring even more of a challenge. In 2018, set a goal to reduce injury during sanitation shifts. PSSI already invests in safety in the plants it cleans. For example, in 2017 PSSI reduced run times for conveyor belts in plants it cleans by almost 30 percent to decrease safety incidents and will continue to expand this program into more plants in the new year. 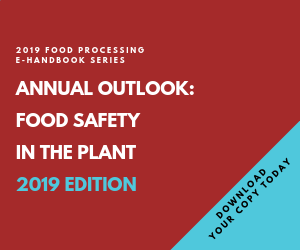 With increased scrutiny of food safety practices by audit authorities, food processors should make 2018 all about converting their plants to the next level of compliance. If you haven’t already, consider switching to digital record-keeping practices. Because documentation and compliance are huge undertakings and require time to adapt, separate your goals by monthly and quarterly indicators. Experts at PSSI can help you document sanitation practices to meet audit demands. Don’t let Listeria or Salmonella become a problem. Stop these microbes in their tracks by redesigning areas of your facility to eliminate troublesome hotspots. Identify machinery or surfaces in your plant that need replacing and budget for hygienic design improvements in 2018. If you aren’t sure where to start, PSSI experts can help you identify potential hotspots and have open conversations about hard-to-reach sanitation areas. Downtime is costly, and when the plant is repeatedly turned over to production behind schedule, this expense adds up. Avoid downtime by ensuring your crew is adequately staffed based on your facility’s needs and that a trained manager stays on top of each step of the cleaning process. Contract sanitation services help tighten the sanitation window since crews are trained specifically to clean plants, decreasing the risk of costly errors. PSSI guarantees against downtime and even pays for the idled labor cost if production is delayed due to sanitation. By eliminating downtime, your internal management team can strategize new ways to use extra production time in the new year. Editor’s Note: This post was sponsored by PSSI. To learn how to get your sanitation program in top shape for 2018, get in touch with the experts at PSSI today www.redefinecleanpssi.com.